Well, what a joyful run that was! The weather was perfect for running; calm, cool and dry. I took no chances and took my inhaler before leaving and tucked it into my waist pack. I set off along a well known route, following the coast. It’s a fairly flat route, as they go. I was determined to take it easy from the off. No silly pace, just steady running, I just wanted 12 miles under my belt. That was all. I was expecting to be a bit stiff and sore after the intervals I’d been doing this week, but instead I felt energised. I was running easy. As I ran it struck me that this was the first time since running the Great North Run that I’ve felt really good about a long run. I felt as if I could run another half, today. It was a great feeling, knowing that I am at that stage in my running that I could just do a half marathon whenever I wanted! It might not always be a fast race, but I know I can more than cover the distance. Another difference today was that I was on my own. My husband had gone with friends to a car show, leaving early this morning and, at 7pm, he’s still to return. I’ve been able to choose when and what I’ve done today, without having to worry about what everyone else was doing and it’s a very liberating feeling! I had initially planned to do my run this morning and changed straight into my running gear after getting up. However, I faffed about getting the washing done and ended up having a light lunch before setting off. It didn’t really matter. I don’t often have this freedom. My miles zipped past. I started off by dividing my run into quarters, effectively running four 5ks. It seemed no time at all before I was making the half way turn. By then the sun had emerged from behind some heavy looking clouds and it was warming up. The road was fairly busy today and, generally speaking, on-coming drivers acknowledge my wave of thanks when they pull across onto the other side of the road. Many happily wave, which is lovely. I get some stern stares occasionally, which says more the drivers than it does about my running and today I experienced a hot-head in a hot-hatch who thought it hilarious to cut as close to me as he could whilst blasting his horn. Clearly he was compensating for something and, apart from a two fingered salute, I let it go. A sad little boy who, in all likelihood, only gets his exercise when running for the bus, or from the police! I’m happy with that. I hit 3.11 miles at 33.04 and 6.2 miles at 1:07:53. My fueling also worked perfectly. I had sips of my drink alone after mile 3 up to mile 6. After that I started taking a dextrose tablet on every third walk break. At no time did I feel that I was lacking in energy. The Dextro tablets cost just 75p a packet and take up less room than a gel. Admittedly I took maybe 4 tablets, but on the Great North Run I took 3 gels! If dextrose is sufficient, it might be a good idea to stick with it. My kit was perfect, although my waist pack felt back heavy initially. Once I’d started drinking it got lighter. I’ll have a rest tomorrow, although I need to do my core exercises, and run again on Tuesday. I’m on holiday from school so hopefully it’ll be another outdoor, smile on my face run! This week has been one of trying new things. Don’t panic, I’m not about to reveal anything unsavoury. In an effort to reduce my 10k times I’ve been following Jeff Galloway’s Easy 10k app, jumping in towards the end and syncing the whole thing with my upcoming race at Jedburgh. As I’ve said, Jedburgh is not a PB course, but I would like to beat last year’s time. And then some. This week has seen me doing tempo runs and interval training, sorry people but, all on the treadmill. It’s dark here now by half 6 and I can rarely get out before that. Early morning runs are similarly marred and I don’t have any choice but to run on the road as we have no paths. The trails I run on would be treacherous in the dark. So the treadmill is my winter training friend. The interval training was a bit of a revelation. I’d started this app before doing my Great North Run training and found the interval speeds hard going. Not so this week! Yes, it wasn’t easy, but I also wasn’t running myself into the ground and having to stop, like I was before. I had limited time so I only managed 12 of the 18 400m intervals on Thursday, finishing off the last 6 on Friday. All good stuff. 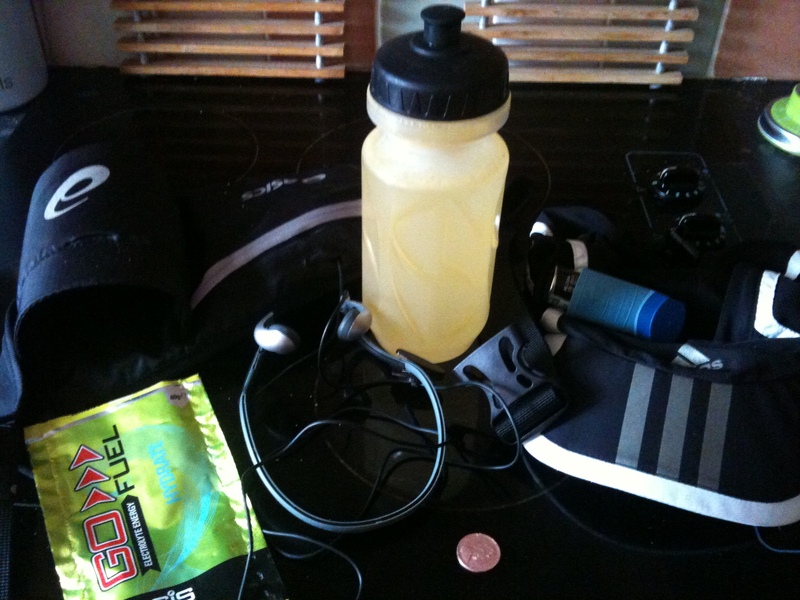 Today I’m down for a long run of 12 miles, rather excessive perhaps for 10k training, but I’m looking forward to it. I am wearing my Jedburgh kit, checking it out before the day (I have my sensible head on), I’m trying SIS electrolyte juice as it comes in dry powder form and is easier to carry than bottles of juice when I’m away from home and I’m putting my iPhone in my waistpack instead of on my arm (I’ve been suffering from friction burns and would like to avoid them). I have no gels! Instead I have Dextro tablets to take every 15 minutes after an hour and, if the worse comes to the worse, good old fashioned Kendal Mint Cake! My bag of stuff; my SIS drink, a gel plaster, some paper towel, dextrose tablets, Kendal Mint Cake, my inhaler and my lucky ‘BOOM’ penny found on a previous run. I’m good to go. I’m not aiming to do the fastest 12 miles ever. I’m going out for a nice run in the Autumn sunshine, once the sun decides to come back out from behind that massive cloud. I’ll see you later and let you know how it went! Easily offended? Look away now! Sorry, I just had to get it out there. I’m just home after one of the worse runs I’ve done in a very long time and I’m so bloody annoyed with myself. I have excuses, but I’m not listening to them. Neither should you. It’s an absolutely gorgeous day here in south west Scotland; the sun is shining in a blue sky, there’s not a whisper of a breeze and it’s cool, as Autumn days here tend to be. I love such days. I was so looking forward to a nice, easy 7 mile run this morning. I had new kit to try out, a Shock Absorber bra bought with much cheapness from eBay and a new vest top to boot. I was genuinely pleased to get out there. This morning I reached for the Jeff Galloway 10k training app on my iPhone. Looking at the first time and the improver settings there was no way the app and the book matched. No way José. Bugger. According to the app, whichever one I looked at, I was due for a 5k “race”. Well, the weather was perfect for it and I could run on a fairly flat route. Yes, OK, 5k it was then. The last time I ran a 5k race was the Race for Life in July. I did the race in 28:17, beating my previous time of 30:12 by quite a margin. Last year I had a cheap sports watch and nothing to tell me how far I’d run. This year I had my Garmin. When I posted my time on here with a report one eagle eyed follower said that something wasn’t tallying. I said I’d check it out, but I forgot and just accepted my time as read. Today’s events gave me cause to have a proper look. I was devastated to discover that the Race for Life wasn’t a 5k at all, it was short by 0.23 miles. I ran 2.87 miles in 28:17. No wonder my pace was 9:52. No wonder it didn’t tally. Well done Eric for spotting it. In my misplaced euphoria I missed it completely. So what happened today to make me look you ask? Well, with Jeff Galloway in my ear, I set off from the village having set the app for a 9 minute mile pace (quite quick for me) and 4:1 minute run/walk rate. The first half a mile was meant to be a warm up. By the first quarter of a mile I knew I was in trouble. I had, sensibly, had two puffs of my inhaler before leaving the house, however these were having no effect. For all it was sunny and warm (I’d been hanging the washing out before I left in my running vest), the air was cold. A few intakes of cold air and my lungs couldn’t cope. I started wheezing and gasping for breath with every step. I gave myself a good recovery time after the half a mile warm up, walking up the hill to get as much of a flat route as I could for the “race”. When I started “racing” I was not really any better. I was meant to be running around 8:30 pace and, according to my data, I was slightly faster than that to begin with. Maybe I was just running too fast at the start? I was listening to the music and running to what I thought was the beat, but that first run section had me running between 7:30 and 8:30 pace. That’s really fast for me and maybe this is why I couldn’t sustain it? I was struggling to breathe properly; I couldn’t manage a deep breath at all. My first mile came in at 9.23. I tried to keep my pace as constant as I could, hoping that my breathing would settle down. I’m not sure how many additional puffs I’m allowed on my inhaler. I’ve never needed anymore than a couple. Maybe I should start carrying it in my pouch as a precaution? Even as a reassurance? I also put in more walk breaks when my chest really tightened up. I wasn’t giving up on the run, but I had to make it manageable. 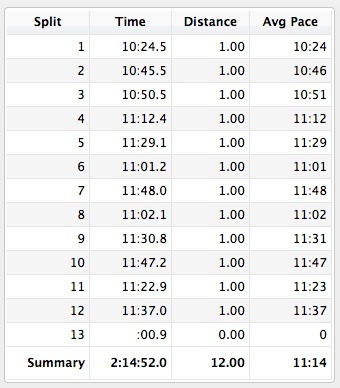 My second mile running pace was still between 8:00 and 8:30 pace and I finished it in 10.02. By the last mile my pace had started to slow. On my running sections it ranged between 7:55 and 10:08! I was walking less, but running slower and mostly uphill, albeit gradual inclines. Walking further at the start had meant that I was going to finish long before ‘Grant’s Hill’, the final hill before coming into the village. 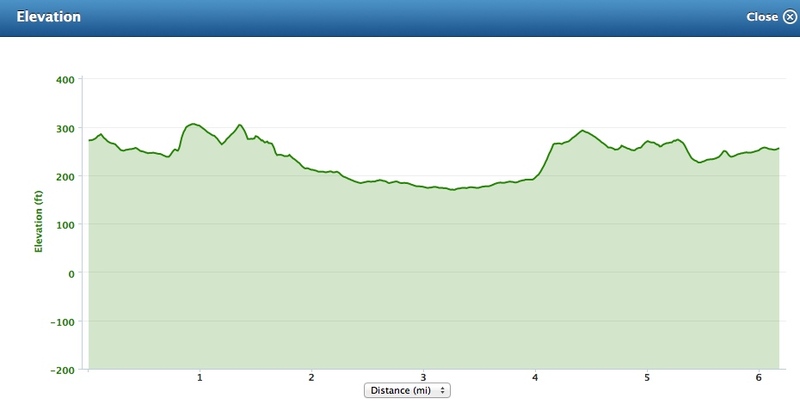 So why I was still running past my start point and on down the hill towards the dip I don’t know! As I came out of the dip I still had tenths of a mile left to do. I hate running up that hill at the end of a run – hate it!!! 3.1 miles didn’t come fast enough. When I hit the stop button I was devastated to see 30.32 as my time, totally devastated. It was meant to say at least 29 point something! Overall pace 9:51. Hang on, something ain’t right here I thought. My overall pace on the Race for Life was 9:52. I’d just run a slightly faster pace and achieved a slower time. This, then, was my fastest official 5k. To say I’m disappointed that I haven’t broken that elusive 30 minute barrier yet is an understatement. So close and so far away. It has taught me a lesson though. I must never trust race directors who say this is a 5k when it is far from it. 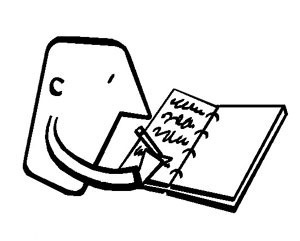 I shall only, in future, compare like for like i.e. one race results with the same race results the following year. The fact that I bettered my Race for Life 2011 time this year by almost two minutes is good enough for me, providing I ran the same course, which I think I did. It does fit in with the fact that I ran the Gallovidian 10k a few weeks back 2 minutes faster than the previous year, following exactly the same course. 2 minutes appears to be the time I’ve improved 5k/10k wise. Which I suppose should mean that next year I will be easily breaking that 30 minute barrier. All is not lost! I really hope that I didn’t offend anyone with my bad language. Truth be told, this was toned down! You should have heard me on my walk breaks if you think this is bad! It struck me today, as I drove home from work, that I appear to be aimless. After months of training every other day and having my runs dictated by an app, I’m feeling a bit lost. As a result I ran only on Sunday and again on Thursday morning, but that’s it. Admittedly I’ve been busy at school, working until very late and coming home to cook dinner before my family starve. Running has taken a back seat. I have two weeks off school coming up so I think some intensive training might be the thing to get me feeling like a runner again. 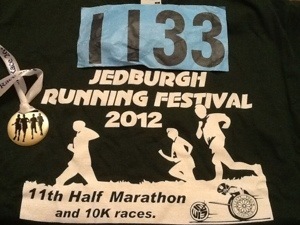 I’ve entered The Jedburgh Festival of Running’s 10k on the 28th. I was toying with entering the Half, but decided against it mostly because I’d have to leave my semi-silent coach waiting for me for over 2 hours in a small town! He’d be bored silly. An hour is fine – walk the dogs, go for a coffee and then there I am crossing the finish line. I’ll be using Jeff Galloway’s 10k app to get me through the race, but I think I’ll go back a bit and do a few weeks of training. 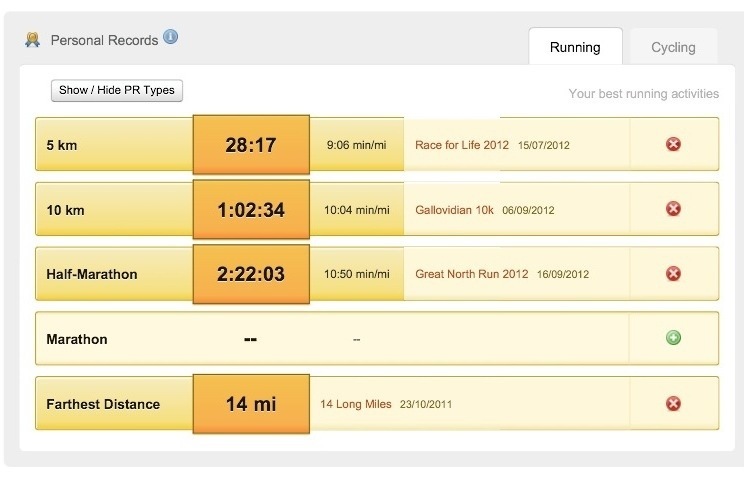 It would be really nice to sub 60, although last year I could only manage 66 minutes, after doing 64 in Dumfries. Jedburgh is not a PB race. I would like to improve on last year’s time though. So this is my next focus. I don’t have the time for anything else before that, no matter how tempting other races sound. I have commitments. End of story. 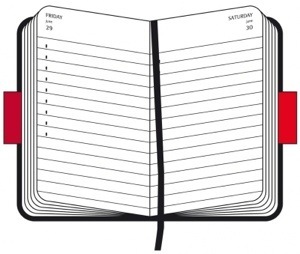 I need to work out where to start on my programme and fill my diary in! I hate that my kit can sometimes smell as if I’ve not bothered to wash it after a run, so I investigated some options. Throw everything away and start afresh (literally), buying a new outfit for every run. Throw everything away and start afresh, washing kit immediately after a run. Go through all my kit, sorting out the smelliest and search the internet for a solution. As much as options 1 and 2 are appealing to me, my semi-silent coach hid the credit card when I mentioned them. So I was left with option 3. The most frequently punted idea was to soak the offending items in a mixture of vinegar and bicarbonate of soda, a good old fashioned idea. I didn’t know how much of each so I resorted to trying 1 tablespoon of soda and a capful of vinegar to a basin of water. I soaked my kit for an hour before putting it in a normal hour-long wash in the machine. I’d be glad to hear from anyone who has another method that works! Not the Last Long Run Ever, just the Last Long Run for now. Yesterday saw me finally finish my half marathon training plan. To be fair, it doesn’t seem that long since I started the programme and now it’s done. Jeff asked me to do between 6 and 8 miles and, originally, I was going to run my favoured loop up out of the village. However, after all the rain we’d experienced in the morning I thought it best to drive the route first. Good call. It was flooded in four separate places and the flood water had washed away temporary road repairs leaving puddles masking massive potholes. I opted to run along the shore road instead, surprisingly enough! When I turned my trusty app on Jeff declared that a 7 mile run was on the cards. As my husband pointed out 7 is indeed between 6 and 8 – he missed his calling as an accountant! Grant, my semi-silent cycle riding coach, joined me for this run, declaring that if he cycled behind me he could see my bottom through my running tights. I was delighted to hear this, 4 miles from home. It was destined to be a long, slow run – no matter what I wanted to do. This was the first time I’d run on the road since completing the Great North Run for a start, but also the pace Jeff dictated was at around 11:30 min/mile. Easy stuff then! I’ve discovered that I really do need to have a puff of my inhaler before embarking on a long run. This stops me from feeling so tight-chested for the first mile and allows me to just enjoy the run. Without it, I become engrossed by the fact that I am struggling to breathe properly! Yesterday I remembered that as I reached a third of a mile. me up once he’d parked the car and got his bike, so I carried on down towards the shore. My pace felt fine, although I was initially disappointed to see that it was far slower than my race pace for, what felt like, the same amount of effort. It was only then that, as someone quite new to racing, I realised how effective my training had obviously been. What I was running yesterday was once my fastest long run pace. Now I know I’m easily capable of running a sub 11min/mile pace for 13.1 miles or even longer. What I know I need to do now is to introduce some track work and build up my speed. I’m now looking at Jeff’s Improver plan with April as my target and the Edinburgh Rock and Roll Half Marathon is in my sights. Yesterday I planned only to run what I needed to do. I ran 3.5 miles out and turned to come back. The last 3 miles felt easier and stronger and I was running faster on them. I tend only to look at my overall pace and run to improve or slow that and at the turn around it was hovering around 11:30. I managed to bring it up to 11:19 by the end of the run, which is no mean feat over a relatively short distance. The important things was that I felt good. My legs felt strong and I was really enjoying running. I could see that my semi-silent coach was having to pedal harder to keep up and, on one hill, I could see the extra effort involved in matching my stride and I laughed. I know that I’m becoming a better and stronger runner. I try not to compare my times to those of others, especially those dramatically faster (that’s you Connie! ), but I can see my times tumbling and that makes me very proud of myself. A good start, followed by some tougher running into a head wind and then a comfortable run home. It’s a good reminder of how far I’ve come and how far I want to go!